Woefully underrepresented in the current film conversation, I believe Never Let Me Go will only grow in stature over the next few years. I saw this mournful film (based on a novel by Kazuo Ishiguro) last week, yet still find it haunting me in a way that brought to mind one of my favorite movies of the last ten years, Children of Men (2006). That's curious because while Children of Men presents a dystopic future, Never Let Me Go gives us a utopic past, or at least an alternate past. Initially, the film focuses on Hailsham, a countryside English boarding school far from the rest of society. Our entry point into this insular world is the school's newest teacher, Miss Lucy (Sally Hawkins). More accessible to the young students than her colleagues, she learns of some of the superstitions which keep the children from escaping the grounds even for some childish misadventures, stories like the one about the girl who stepped outside of the gates, wasn't allowed back in, and died of starvation right at the front entrance. Before the sinister overtones give way to a gothic boarding school story on the order of The Beguiled, a horrific twist is revealed to Miss Lucy's class by the subversive teacher herself. The students of Hailsham are all clones. Each is raised for the sole purpose of providing organs for humans leading a utopic existence in the oustide world. In the second act of the film, we get to know three of Miss Lucy's students now in their late teens, as they transition to a new, grimmer setting, the Cottages. Here, Kathy (Carey Mulligan), Ruth (Keira Knightley), and Tommy (Andrew Garfield), are forced to temper the volatile emotions of adolescence, young love, and the emergence of a new, adult world, with the pessimistic prospects which face them as "donors", the certainty they will reach "completion" after their second or third donation. Rumors of a "deferral" granted to donor couples who can prove their commitment to each other start circulating about while the trio works through a stormy love triangle. Mark Romanek directs at least two of the young actors to fine performances considering the sketchy script. Dialogue is spare, but not to the film's detriment. If one ignores the problematic analogies (stem-cell research? I'm not sure. This is the first time I've ever thought a film could have used a bit more didacticism), Never Let Me Go is about the space between the words, actions, and moments of significance for these young people. It is not surprising that the donors—whose lifespan will top out, at best, at around thirty—would choose to spend their short lives taking long drives into the city, having meaningful conversations, or just hanging out by the beach under overcast skys, contemplative exercises which extend the moment, much like Romanek's small film seems to do. Knightley, unsurprisingly, fares the worst. Forced to downplay her natural beauty to play the decidedly less glamourous Ruth, the actress doesn't really pull it off in later scenes when the once vital donor she plays enters a steep decline as her second donation approaches. Mulligan, whose levelheaded Kathy narrates the tale is far more successful given that her character is more of an observer. She brings a dignity and grace to Kathy (who has grown to become a "carer" for the donors) which permeates the rest of the film, lifting the story above what could have been a simple exploration of one of the many narrow subplots in Blade Runner (1982): how long does a life have to be in order to consider it worthwhile? It is Garfield's movie, though. I now look forward to his turn as Peter Parker in the new Spider-Man feature in a way I never did before. With his performance here he pulls an amazing hat trick, three of the best performances of 2010 including the ones in The Social Network, and Red Riding: 1974. As Tommy's ultimate fate becomes clear during the course of the film, the young actor's sustained note of emotional bewilderment gives way to a cathartic primal scream in the last act, one which encapsulates the rage and the defeat one feels when one truly realizes his/her own mortality. For many, this occurs when someone particularly close to us dies. But for some, including the characters in this film, this takes place after discovering they have a terminal condition. Perhaps it is the overriding tone of resignation, which also pervades the majority of Children of Men, that puts me in the same frame of mind when watching Never Let Me Go. However, it is interesting to note that Children of Men's dystopic story (where humanity has literally died after children stop being born) ultimately ends on a note of optimism. Never Let Me Go proposes a history in which the outside world, us, is so tuned out to the world of donors that we rarely see any of their class, save for ones who deal with the donors on a professional basis. No, this utopia where life has been extended for its denizens has an underclass that is largely ignored, and appropriately, the film's final scene is a downbeat acquiescence to the status quo. The film may have some odd narrative segues, but it moved me deeply to the point, I'll say it's one of the best of the year. Thrilled to read of your eloquent appreciation here. I do agree it will rise in stature too. Yes, it's quite touching. And I really appreciated its serenity. Why do all Oscar hopefuls have to be bombastic? Love your comparison to Children of Men. I've heard others talk about that comparison but no one's explained it as well as you have. ...the young actor's sustained note of emotional bewilderment gives way to a cathartic primal scream in the last act, one which encapsulates the rage and the defeat one feels when one truly realizes his/her own mortality. For many, this occurs when someone particularly close to us dies. But for some, including the characters in this film, this takes place after discovering they have a terminal condition. Garfield is tremendous in this film; off the top of my head my second favorite male supporting performance of the year, behind John Hawkes in Winter's Bone. And what's incredible about his emotional outburst is that it works: because here's a guy who grew up expecting to die, so in a sense he's the last person we'd expect to see so devastated by discovering that, yep, he's going to die. But so it is with all of us; it's one thing to know it's coming, it's another thing to face it. My complaint about the movie is that it too often feels like what it is: excerpted from a novel. I always had the feeling that I was just getting the surface level view of things, the novel's subtext becoming somewhat sloppy cinematic text, a translation that rarely works (if it's subtext in the novel, it should be in the film, too). Now, not having read the book I can't say that's an accurate description. That's just how it felt. Like Kathy's habit of flipping through skin magazines, which was probably effortlessly dropped into the mise en scene of the novel but that in the film is clumsily overt ("this is more significant than it appears"). I enjoyed the film, but I wasn't as moved as I wanted to be. Garfield's performance lingers, but not the rest, alas. In response to Jason's comment about the novel: Ishiguro's novel is extremely sparse, just as his Booker winning The Remains of the Day was. He doesn't give the reader a lot in terms of emotional information (his work reminds me of Hemingway's short stories in that regard...we're always reading between the lines), and one of the things I've been most pleased about in regard to reading about the film adaptation is that the film is appropriately sparse and somber. I never saw the film's trailer, but the fact that the students are clones, and that the school is some kind of Huxley-like experimentation camp is heavily implied by the blurb on the back of the novel. Or perhaps that's just what my mind immediately jumped to when I found out years ago that Ishiguro was writing a science fiction novel. I never felt like the "clone" aspect of the novel was ever meant to be that much of a surprise. Perhaps I'm misreading your comment, though. Oh, and I do remember the skin magazines being a prominent part of the novel. I seem to recall the motif being there throughout the first third of the novel. It's been a while since I've read the novel, though. Great review! Sorry I don't have more to add...I haven't seen the film yet (thanks Salem's only art house theater for keeping it around a mere week! ), but I'm eagerly awaiting its DVD release. I'm saddened to here that Keira is the worst of the three...it won't have any effect, though, on my unhealthy infatuation with her, hehe. Jason, I've learned to tune out anything but visuals when watching a trailer. It helped me ignore the spoiler for CHILDREN OF MEN. And thankfully, I missed NEVER LET ME GO's trailer entirely. I've also made it a habit not to read reviews for a film before I watch it or even write my own. In this case, it seems like I was right to do so, since I can't see a way to discuss the film without revealing its hook. Kevin, I'm sure you will enjoy this film. As I tried to get across in my review, it is definitely not the best film this year. I found some weaknesses which preclude it from being labelled so, including not so much Knightley's performance because she really gives it her all, but her casting. However, I still anticipate my estimation for this film will grow with some time and distance, and I wouldn't be surprised if I end up including it in a Best of the Decade list 10 years from now. Kevin & Tony: First, just to clear up any confusion, my comments about the trailer giveaway and the novel weren't related. The film doesn't immediately spell out the cloning, but it's made quite obvious quite quickly. That said, the film does look to create quite a bit of mystery and dramatic tension around (a) whether Tommy and Kathy are wasting their time by going in search of a kind of life-extension hearing that might not even exist and (b) the significance of their childhood artworks. And both of those things are revealed by one moment at the end of the trailer. The irony is that, like Tony, I avoid trailers at all costs. At the theater, as soon as I've seen enough of something to convince me I want to see it (and sometimes that's just the "From director ..." credit), I'll close my eyes (unlike Tony, I'd rather not see the images). And at the theater I often go so far as to plug my ears (silly, but effective). 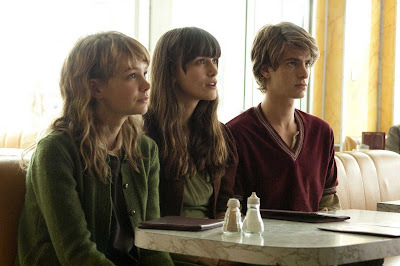 I encountered the Never Let Me Go trailer just once, and I looked away. But I still heard that last line, which was so overt that I believed -- foolishly -- that it must be misleading. I do remember the skin magazines being a prominent part of the novel. I seem to recall the motif being there throughout the first third of the novel. It's been a while since I've read the novel, though. Yeah, that's what I expected. In the film, there's basically one scene in which Kathy looks through a nudie magazine. Later there's a line of dialogue that tries to make it seem like it was a semi-habit, but in the film it's just an odd little insertion that you know must be significant because it's too awkwardly inserted not to be. That's just one example, mind you, of the film feeling like it didn't naturally translate from the novel. It's certainly worth seeing. As with Tony, my opinion of the film might increase when I revisit it (though right now it would be hard for me to imagine going so far as a Best of the Decade list). Garfield is tremendous.